Catherine Sicot: I’d like to look at the genesis of LASA, starting with the evolution of Candelario’s work in the past few years. Candelario, how did you move from working with traditional media to undertake collaborative processes in the public space? Candelario: The subjects of my drawings and paintings had always been people, social behaviour and personal issues but the form of my work changed when Aurélie invited me to participate in ‘Mehr licht!’ (‘More Light!’, 2003–06), a project involving participatory works, performances and actions, which took place across three suburban neighbourhoods with a history of communist municipal government: Ivry-sur-Seine, Paris; Brandenburg an der Havel, near Brandenburg; and San Agustín.1 Through this project, I discovered new forms of art practices and it made me want to engage with performances and installations in the public space. CS: Aurélie, how would you describe your contribution to the creation of LASA? Aurélie Sampeur: I wanted to continue exploring the potential of ‘Mehr licht!’ and was drawn to San Agustín because I found that people there were very keen on participating. CS: Is this what triggered your desire to explore senses – taste, sound and sight – in ‘Public Attempts’ (2008–10), your first set of projects with LASA? AS: Yes, participation was essential to ‘Public Attempts’, but it was also a curatorial gesture towards Candelario’s artistic vision of San Agustín as a human entity. About fifty artists developed work for San Agustín. 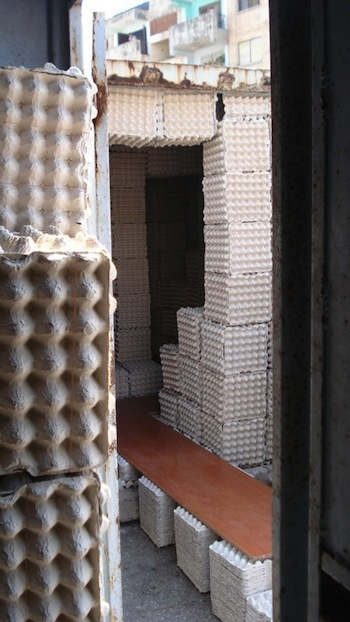 Arnaud Sallé, a French sound artist, for example, compiled an archive titled Corporación donación de ruidos (Noise Donation Corporation, 2009).3 He had noticed discarded shipping containers lying around and decided to use one of them to create a soundproof space in which to house and build an archive. Sallé insulated the container with egg boxes to offer visitors a recluse – a genuinely private space in which to express their thoughts. Visitors were given an archive box when entering the space, into which they were invited to symbolically deposit noises, songs, gossip, dreams, lies, silences, secrets or lamentation, as loud as they wished. Participation was massive – people came to find a moment of isolation, a very rare opportunity in Cuba. They came out amused, moved, and sometimes crying. 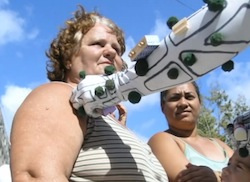 CS: Have you pioneered this type of art practice on the island, or was there experimentation like this before? AS: While developing LASA, it became clear that my cultural background and the way I worked was entirely different from Cuban culture and habits. Candelario was also experimenting with some approaches very new to him, certainly radical in San Agustín and non-existent on the island. Some experimental projects were happening within institutional contexts such as the Bienal de La Habana and the Wifredo Lam Centre, in Havana, but not so much in the public space. Art practices involving community participation and the public sphere have not been part of the critical discourse in Cuba in the same way as they have been in the West since the mid-1990s. So everything tends to get mixed together under the label of ‘community art’. Most local critics still look at us from a social and political perspective rather than an art historical one. CS: Practically, how have you been able to work independently, invite foreign artists in residence and produce these kinds of projects? AS: When we first established LASA in 2008, a registered artist could only get contracted by a state company to paint official portraiture or landscapes. Now furniture, interior design and renovation have entered the sphere of what an artist is allowed to commercialise. At LASA, Candelario has been able to take on design and technical work, and chosen to dedicate 75% of the income from this to the production of art projects and LASA’s operating expenses. As a foreign curator with a resident status (obtained through my marriage with Candelario) I have more access to international funding opportunities than a Cuban. 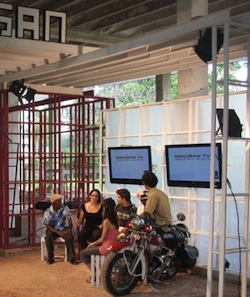 The foreign consulates of France, Germany and the Netherlands, for example, have been supportive of our work since the beginning because they were interested in seeing artists from their countries involved in Cuban experimental art projects that operated outside of established cultural and institutional structures. We have always tried to avoid being dogmatic or to position our work as explicitly political, that is ‘for or against the revolution’, and have instead swum between boundaries in order to achieve what we wanted from an artistic standpoint. CS: Many projects of the projects which featured in MAC/SAN: Museo de Arte Contemporáneo de San Agustín (2012) the project which we worked on together and took place during the latest Bienal, explored the question of entrepreneurship in Cuba. A collaboration between LASA and artists Stefan Shankland and Erik Göngrich, MAC/SAN functioned as both a temporary art institution (open for two weeks and featuring eleven participatory projects) and a sculpture that pastiched the kind of trendy art centres that crop up in such peripheries.5 One of these projects, Göngrich’s BIOCUB – Artist’s Nutrition (2012) proposed that people develop their own businesses drying mangos eleven mango dryers were installed on the MAC/SAN rooftop alongside the artist’s drawings, and seven dryers were given (permanently) to the homes of participating families so that they could produce and sell dried mangos. Visiting the various families we found that not everyone had followed the artist’s instructions: some experimented with drying lots of different fruits and were eating them instead of selling them, while others never touched the dryers, which became a new bit of furniture in the house. The project was a strange experiment that initiated an interesting intercultural dialogue – in Cuba the idea of eating dried, not fresh, mangoes is a little sacrilegious. We later heard that the Cuban public health department was searching for ways to encourage snacking on dry fruits and had looked at our project. Other enterprises proved more sustainable. Colombian artist Alex Morales’s project CUBIC –OH (2012), which brought together local ‘retired’ break-dancers and students from teacher training schools, resulted in the establishment of a small theatre company named Sin Diploma, which is still active in Havana. Candelario, your project MAC/SAN TV (2012–ongoing) still continues through various means.6 Can you describe how it all started? C: I wanted to get some media attention for MAC/SAN and knew how difficult it would be to do so in Cuba, so I set about creating our own media tool, MAC/SAN TV. As I am not an official journalist, I would never be allowed to broadcast on national TV, so I decided to broadcast through USB sticks (what we call here the ‘Cubans’ internet’).7 Use of the internet is partially censored in Cuba, with no access to Skype for example, and there is no proper infrastructure for high-speed connection, and so, in order to share the kind of information and footage which would normally be shared on the internet, Cubans circulate USB sticks as an alternative mode of dissemination. For MAC/SAN TV, I worked with an interdisciplinary team of architects, designers, journalists and students and developed a brand for the TV channel, a DIY TV studio and a programme of interviews, artists’ talks and discussions.8 I wanted the format of the programmes to refer to what people are used to seeing on Cuban TV and the content to focus exclusively on San Agustín – from a mock weather report (sitiologia) to clips and animations showcasing local characters and depicting local issues. We did not do soap operas – big in Cuba – but only because we did not have time. CS: These works seem to extend into LASA’s position as a social business itself. Alongside the residencies and art projects, the commercial activity at LASA has become increasingly structured in an attempt to maintain its sustainability. In that sense, LASA exemplifies the transition from communism towards a sort of social capitalism currently taking place in Cuba. What is your personal experience of this transition and how do you see the changes in Cuba impacting upon the practices of LASA? C: The changes have reshaped a number of our working methodologies: we started working mainly for state-owned companies and we now take on an increasing number of private contracts. The money from these contracts in decorative painting, interior and furniture design mean we will be able to sustain the programming of more events. We hire designers, architects, engineers, welders and woodworkers for this work (paying them four or five times what they would receive from a government job) and in exchange, as members of LASA, they contribute to the production of projects like MAC/SAN. The contracts from the state companies have reduced over the last two years and will eventually die out because they are entirely connected to the way the current system functions. The government has recently launched a new slogan: ‘¡Cambio de mentalidad!’ (‘Change of perspective!’). This doesn’t mean that those who didn’t understand us before, do now, but at least this slogan reminds them that they have to open up; otherwise they wouldn’t be changing their perspective and therefore they would disobey. So, this is good for us, and as artists we can play with it. CS: The line is hard to draw here. It seems that you are both generating changes, although still using the system. Is the free enterprise spirit of both your art practice and your approach to sustainability a form of activism? C: LASA activates a periphery of Havana both economically and socially. In this sense, it has a political impact. However, ‘activism’ in Cuba describes a dogmatic anti-Castro position. Our work is not and has never been geared towards such a position. So, in the Cuban sense of the term, I am not an activist. Our purpose is to experiment with art forms in the public sphere and a side effect of what we do is that people are stimulated to transform things their own way. 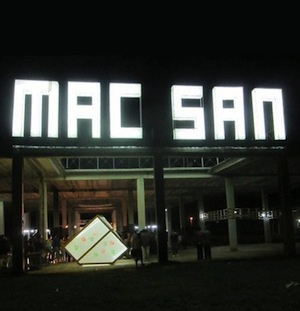 MAC/SAN TV (2012–ongoing) will be part of a survey exhibition celebrating the 30th anniversary of the Bienal de La Habana organised by the Wifredo Lam Centre from 22 May to 22 June 2014. For more information, visit the MAC/SAN blog and the LASA website.